Korean fleet led by Yi Sun Sin. The Battle of Noryang, 18 November 1598, occurred when a Japanese fleet led by the Shimazu clan tried to break through the blockade. Although the Shimazu fleet was severely damaged by the combined Chinese-Korean fleet, the Japanese Sunch’on garrison was evacuated. Yi Sun Sin was killed in the battle. The Kobukson, also known as the Turtle Ship, was the first ironclad warship in the world. 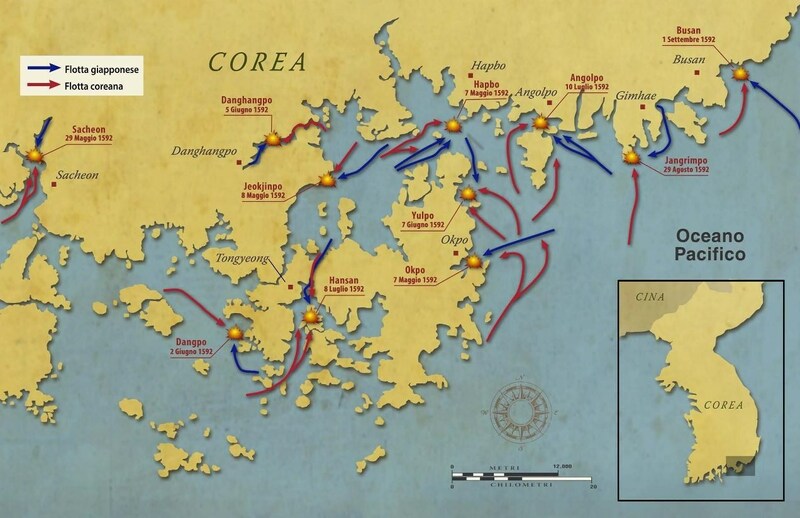 Boasting unparalleled firepower and mobility, it proved a pivotal instrument for victory in the sea battles under Admiral Yi. Effectively a sea tank, it was capable of sinking large numbers of enemy vessels, and so did much to maintain the morale of Korean sailors, so often outnumbered by the vast fleets of the Japanese navy. 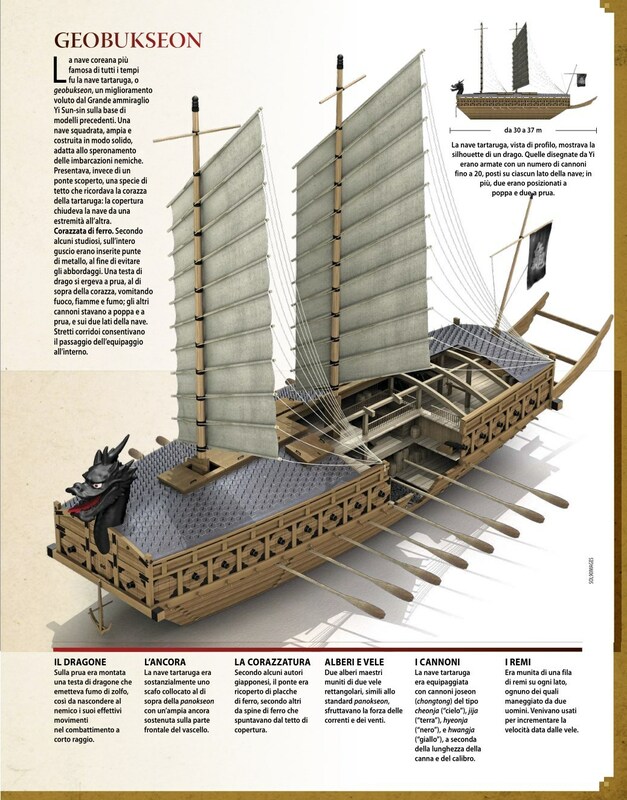 It should not be supposed that Admiral Yi designed and built the Turtle Ship entirely by himself. The planning and the actual construction of the Kobukson required the combined efforts of a large number of people, both craftsmen and naval officers. 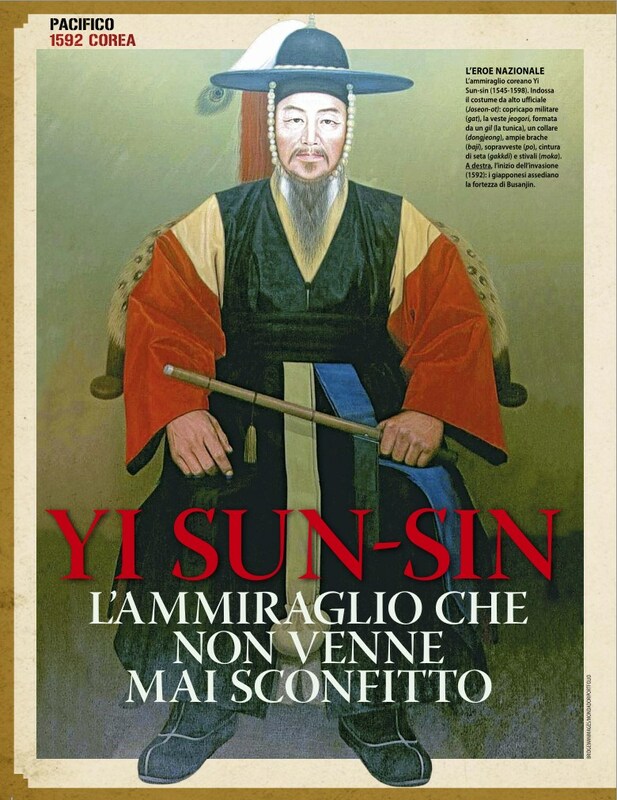 On the practical side of the work, for instance, Na Dae-yong (1556-1612) played one of the most important roles in bringing the plans for the first ship to fruition. The following are the main features of Kobukson, as recorded by Yi Sun-sin’s nephew, Yi Boon, in his book, Haeng Rok. – Its dimensions are 34.2m in length, 6.4m in height, and 10.3m in width; it is thus roughly the same size as a Panokseon (the standard warship of the Korean Navy at the time of the Seven Years War). – The prow is fashioned in the shape of a dragon’s head; cannon balls are fired through the mouth. – The stern is in the shape of a turtle’s tail. Additional gun ports are stationed beneath it. – The turtle’s ‘back’ is a roof made with planks, and is covered with iron spikes. Amid the spikes is a narrow, cross-shaped alley that serves as a passageway along the roof for the crew to use. – Six gun ports are positioned on each side of the deck. – During combat the spikes on the roof are concealed with straw mats, on which an unsuspecting enemy will be impaled if he tries to board. – Any attack from port or starboard is repelled by arrows and cannon-fire, which can be launched from every part of the ship. – From the inside, the outside can be seen, but the inside cannot be seen from the outside. – It employs every variety of projectile-based weapon, including long-ranging cannon such as Chon (Heaven), Chi (Earth), Hyon (Black) and Hwang (Yellow). – As such, it is able to roam freely and unopposed amid many hundreds of enemy ships. The Kobukson was mounted with a dragon’s head at the bow, and a turtle’s tail at the stern. It had two decks, a lower deck for oarsmen and the storage of supplies, and an upper deck for archers and gunners. It was specially designed so that its sailors could see their enemies outside while themselves remaining invisible. In the naval warfare of the day, it was usual to attempt to board an opponent’s ship and engage him in hand to hand combat. The Kobukson was designed with a view to making this kind of assault particularly difficult. Not only was the ship roofed over, protecting both combat(45) and non-combat(80) personnel alike, but the roof itself was fitted with deadly iron spikes, often concealed beneath innocent-looking straw mats. Unlike other warships, the Kobukson had guns stationed not only along its sides, but also in the bow and in the stern, allowing it unprecedented accuracy and flexibility of range in fire power. 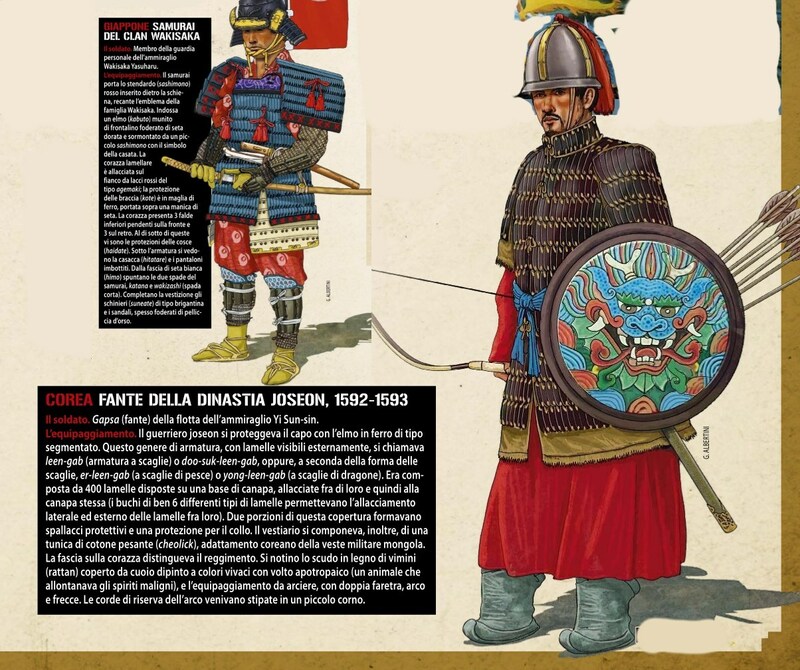 The dragon head was designed not only to ‘breathe out’ flaming arrows and cannon balls, but also sulphurous fumes and clouds of smoke, which provided the Korean Navy with cover for tactical maneuvers, as well as frightening the more superstitious of the Japanese sailors. A little below the bow, there protruded the head of a gargoyle, which served as a charging device, and together with the dragon head constituted the secret of the Kobukson’s tactic of ramming. In battle, the Kobukson would charge an enemy ship and, once the gargoyle’s head had breached its hull, cannon balls would be fired from the dragon’s head into the breach as the ship withdrew. The gargoyle had the further effect of improving the ship’s hydrodynamic performance by cutting the waves as the ship sped along, thus increasing its ramming speed. Two further features of the Kobukson made it particularly serviceable for the execution of this tactic. First, it was built with Red Pine timbers no less than 12cm in diameter; the advantage offered by this type of wood was that its relative density of 0.73 was much higher than that of average timber, which lay typically between 0.41-0.47. Secondly, wooden nails were used in the construction of the Kobukson; unlike metal, which was quick to rust, the wooden nails absorbed water and expanded, and thus over time the joints became more secure. Indeed, the Kobukson as a whole was constructed on this principle: support beams were fitted to the roofs by means of a system of matching indentations and interlocking teeth, thus making the entire structure of the vessel stronger and more resilient. The Japanese ships, built out of wood with a low density, were light and swift, but the relative weakness of the wood to withstand the recoil of a cannon put a restriction on the number of heavy fire-arms that could be carried on one ship, and consequently they normally preferred to use muskets, which had a maximum range of 100 meters. The Kobukson, on the other hand, were able to carry a whole array of different cannons on board, including long-distance cannons such as the Chon (Heaven) with a range of over 500 meters, the Chi (Earth), its slightly smaller companion, which had a range of 350 meters, and the Seung (Victory), a portable cannon, with a range of up to 200 meters. Kobukson had 8 oars on either side, with a team of five men – a leader and four regular oarsmen – assigned to each oar, making a total rowing crew of 80. During combat every oarsman was expected to be on duty, but at other times they would take turns at the oar in pairs. The leader would direct his colleagues to row forward or backward, to increase or decrease speed, to halt or turn about, according to the changing circumstances of the battle. This innovative division of duties thus gave the Kobukson superior potential of movement not only in terms of speed but also in terms of the range of its possible maneuvers. The combat personnel on board the Kobukson were divided into three groups: Gunners, Chargers, responsible for the loading of cannons with shells and gunpowder, and Archers. It was thus possible for the Kobukson to produce an uninterrupted shower of cannon balls and fire-arrows, wreaking havoc on everything that came within its range. The number of gun ports generally varied from ship to ship, but the Tong Je Young Kobukson which we find described in the Complete Works of Yi Sun-sin, had a total of 74: 12 ports on either side of the turtle’s back, 44 on either side of the shielded boards underneath, 2 above and below dragon’s head, and so on. Invented late in the 16th century, Kobukson was a unique warship, the like of which cannot be found used anywhere else in world naval history. Planned with meticulous care, and the result of much detailed scientific research, it boasted unsurpassed structure and performance. Above all, much meaning lies in the fact that Kobukson was a refinement and a remodeling of P’anokson, the existing warship of Korea, based on careful investigation of the primary Japanese tactic of grappling and boarding. Replicas of Kobukson are on display in various national museums, such as the War Memorial of Korea, as well as in other museums throughout the world, such as the Wasington D.C. War Memorial Museum in North America, the Maritime Museum of Great Britain, and in many other countries including China, Japan, Germany, France, Canada and so on. This entry was posted in Wars, Warship by MSW. Bookmark the permalink.